Prior to the release of our next major update, the Infinity Lock Box will return for another brief run! This special Lock Box, containing prizes from nearly all previously-retired Lock Boxes, will be available again for a limited time starting after maintenance on July 6th, 2017 and ending on July 18th, 2017. During this time, enemies defeated on both Ground and Space maps will have a small chance of dropping one of these prize-filled packages, while the Privateer Lock Box will be retired. Each of these allows access to a special 23c. Duty Officer Assignment. The Briostrys reflects the elegant beauty of Xindi-Aquatic engineering. The ship's exterior design has remained almost completely unchanged for hundreds of years, but has undergone extensive internal refits on a regular basis in order to maintain its reputation as a high-firepower threat deterrent. It combines strong offensive capabilities with enough versatility to support both itself and its hangar craft in any confrontation. This starship features a Lieutenant Science/Command Bridge Officer Station and a Lieutenant Commander Universal/Intel Bridge Officer Station. This Console Mod can be equipped only on Xindi starships, in any console slot. You may only equip one of these mods. While this trait is slotted, your first hit with Beam: Overload will cause a 2km radius explosion that deals radiation damage and reduces the damage resistance of affected foes. The Sistruus has long been a last line of defense of the Xindi people. 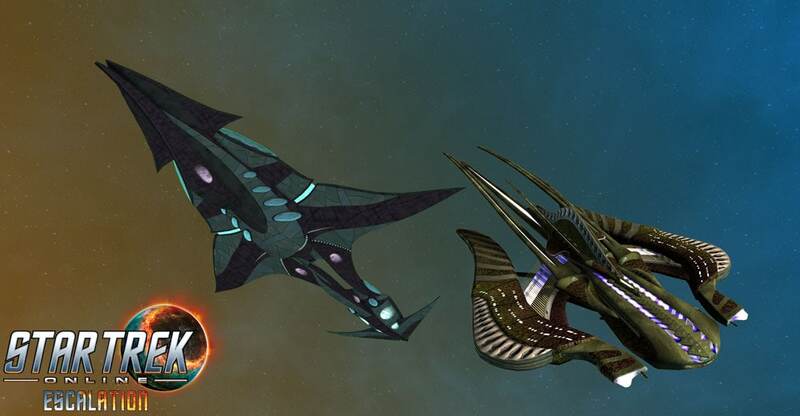 Despite their aged design, these nimble escorts remain capable of holding their own in battle against modern aggressors, but are usually held in reserve for coordinated hit-and-run strikes, while allowing the larger Aquatic Dreadnoughts to patrol their borders against aggressive threats. This starship features a Lieutenant Commander Engineering/Temporal Operative Bridge Officer Station and a Lieutenant Universal/Pilot Bridge Officer Station. Heavy Proton Charges will automatically seek out the nearest foe within 10km, and rush toward them. Once close enough to their foe, they detonate dealing heavy Proton damage in a 2km area, and also reducing the Defense of foes in that area. You may only have 6 Heavy Proton Charges in play at once, and will be unable to fire additional shots until the existing ones have delivered their payload or timed out after 60sec. This console may be equipped on any Xindi starship, but only one may be equipped at a time. While this trait is slotted, activating Auxiliary to Emergency Battery, Auxiliary to Structural Integrity, or Auxiliary to Inertial Dampers will provide a substantial boost to Hull Regeneration and Energy Damage Resistance Rating for a short time.